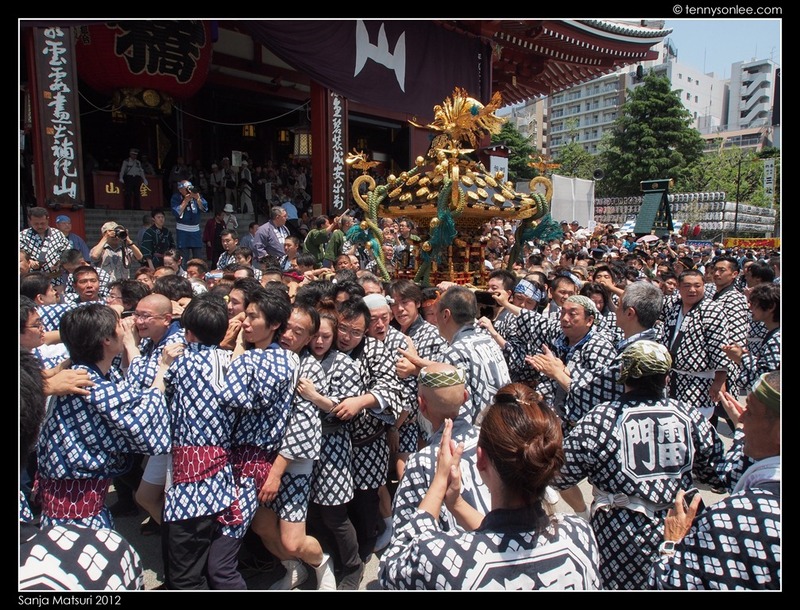 The highlight of Asakusa Sanja Matsuri festival is the procession of over 100 portable shrines (float, known as Mikoshi). The team rocked the float from side to side, with the crowd cheering on them. Energy of the participants were at all time high. 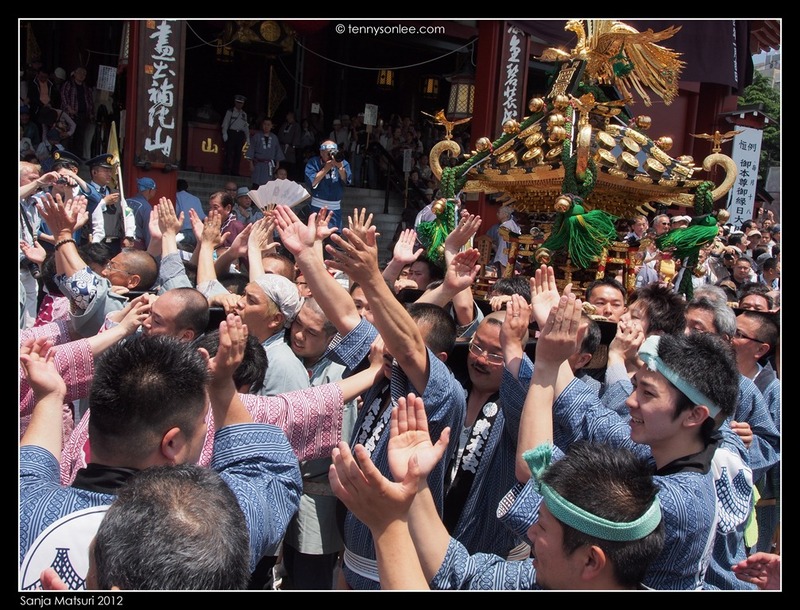 Over 100 mikoshi from the nearby Asakusa 44 districts will be paying tributes to The Goddess of Mercy (Kannon). 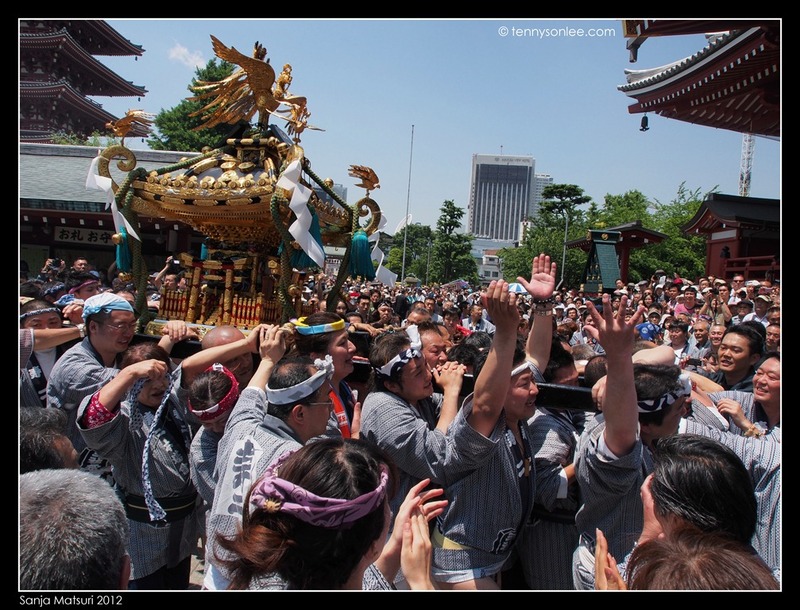 This could be seen when the participants raise the mikoshi in front of the Kannon Hall. 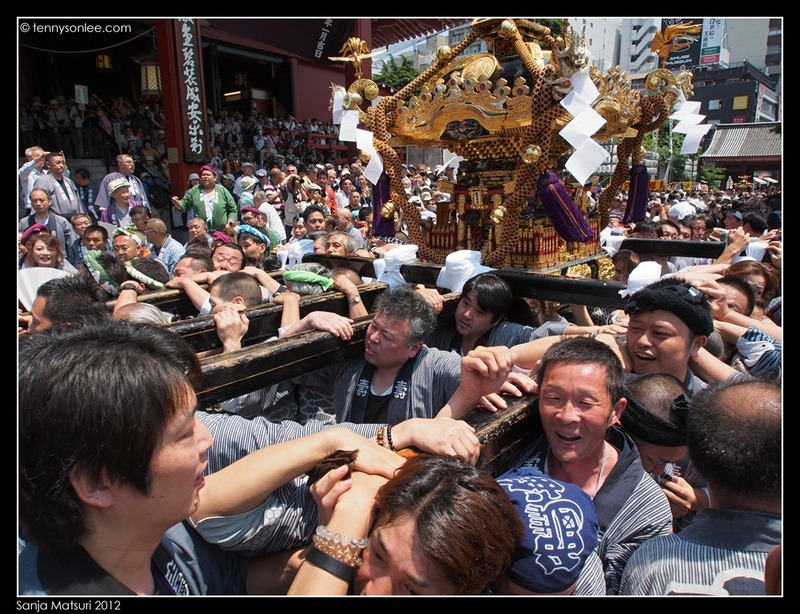 The float would be carried to the open space behind the Kannon Hall, next to the Asakusa Shrine. 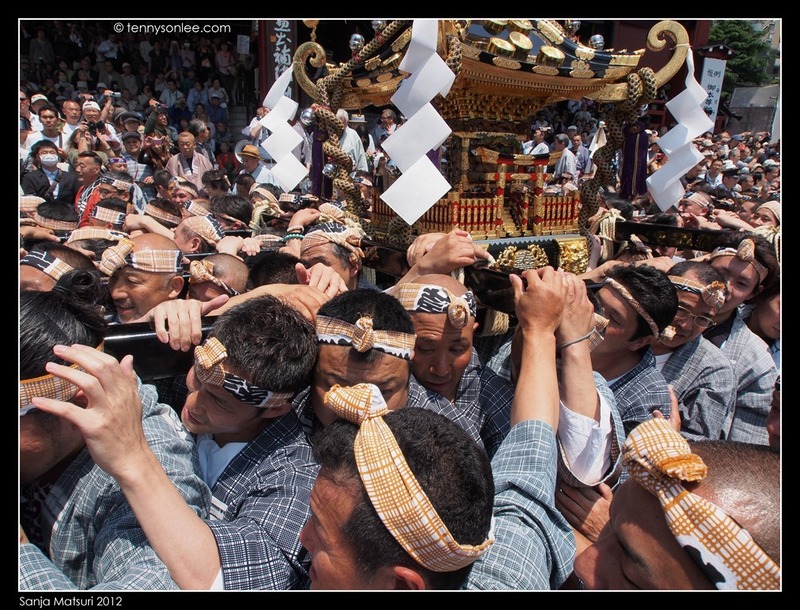 The mikoshi would later be blessed (purified) by the Shinto priests. 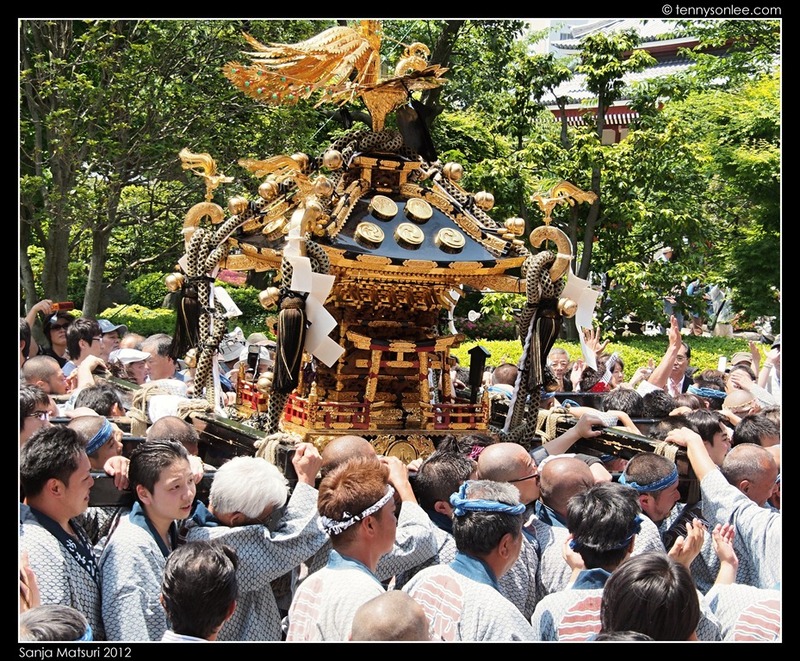 Today (the last day of the Sinja Matsuri festival) is the largest parade. 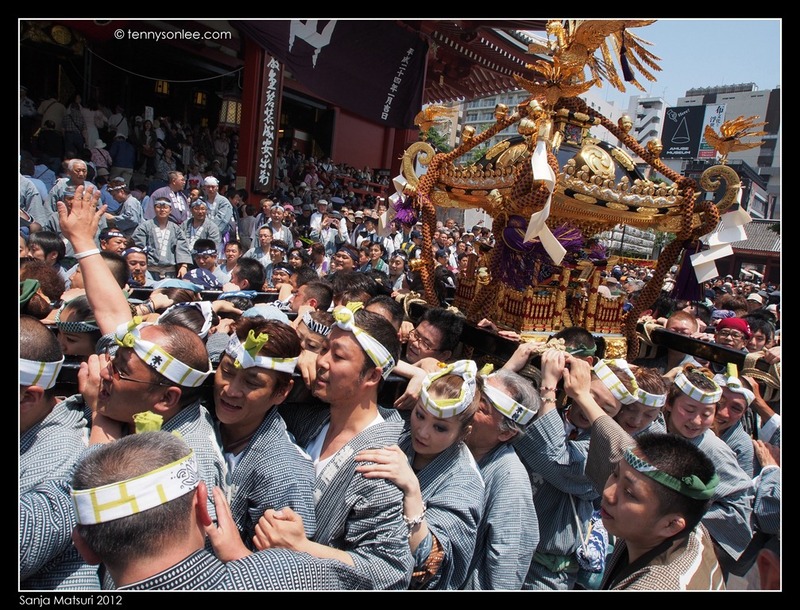 Too bad that I have left Tokyo, so no chance to see the Yakuza (who has whole body tattoo and standing on top of the float). Everyone was cheering and keeping the spirit high. Police officers and community folks help to keep the floats save from the crowd. 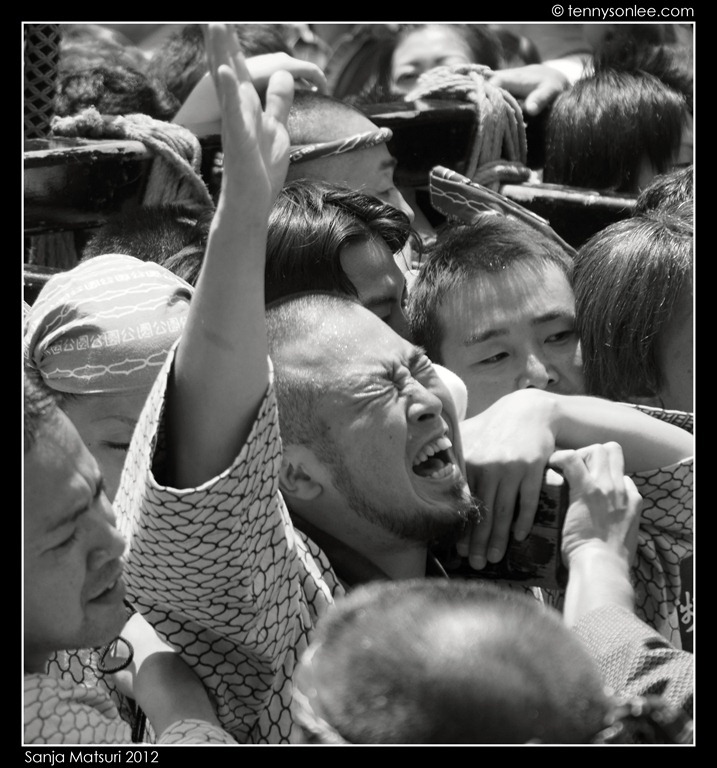 It was dangerous to stand too near to the procession route. I was standing right at the corner to get close to float without using zoom lens. At few incidents the floats would hit the crowd, so one has to take extra caution. You could notice there were always helpers who protected any sharp edges to steer the float as well as to prevent it from hitting on others. 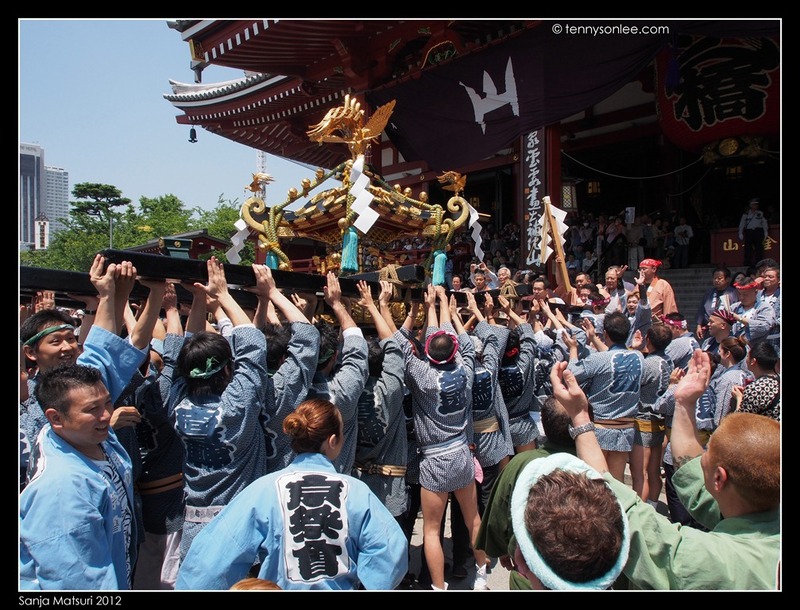 It was a long way back to the starting point, so participants could swap and take turns to carry the mikoshi (while the float was still proceeding). 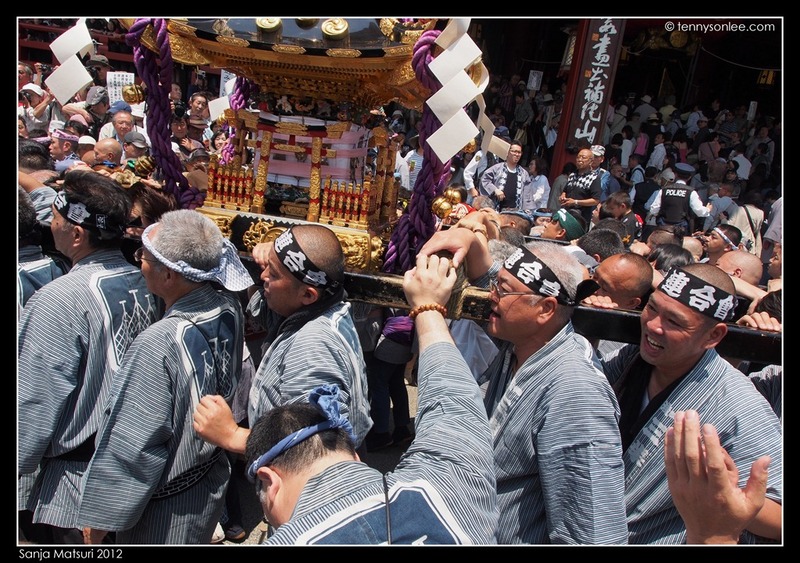 The mikoshi portable shrine was made of wood and was heavy. If you love the being knock over, this is the best place to be. 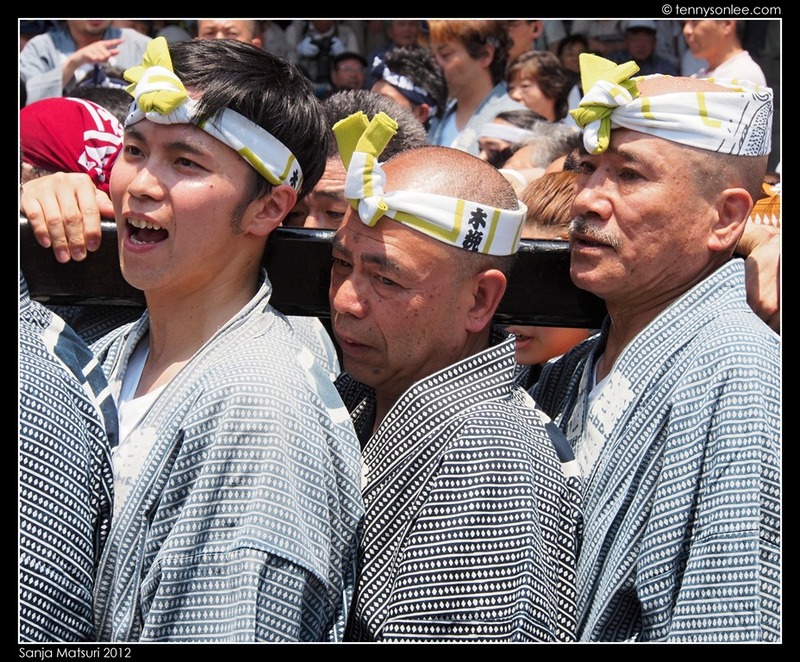 This year is the 700th anniversary of Sanja Matsuri, so more people turn out for the festival. 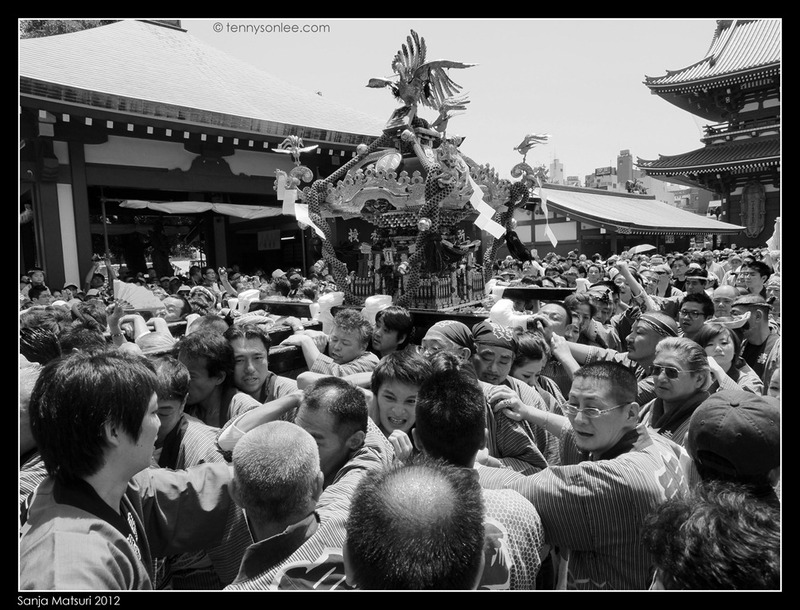 It is definitely an experience of the life time to be able to witness this festival in close proximity. This entry was posted on May 18, 2012 by Tennyson. 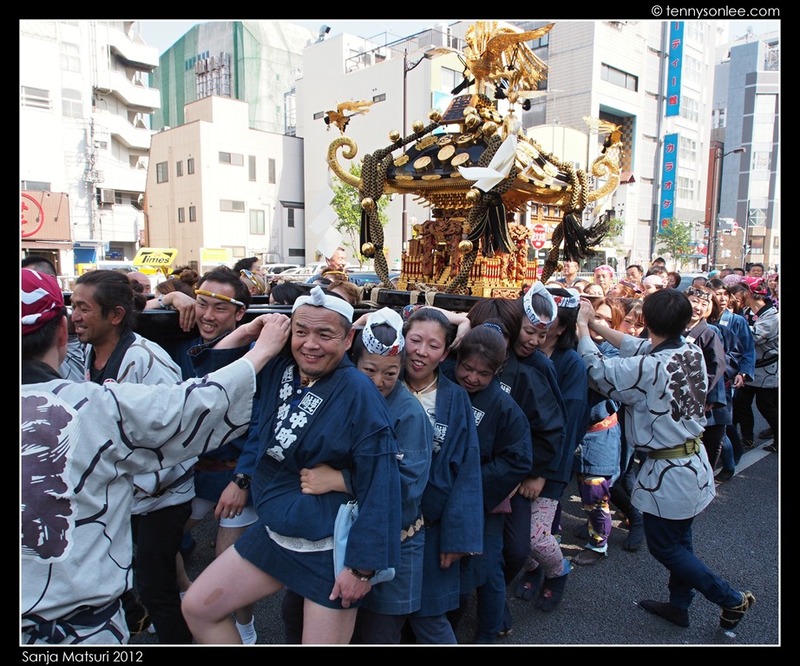 It was filed under Japan, Places, Tokyo and was tagged with Asakusa, 神轿, Daigyoretsu, mikoshi, Sanja Matsuri 2012, 巡遊, 浅草三社祭.